Usually the iris are starting to bloom about now, and we do have some iris blooming here. But, it seems that it is not a good year for them. Not just this garden either, but the other one that I take care of as well. Very few blooms in both of them. And the other one has a garden that is set up specifically for iris, and iris love it, but very few blooms there this year as well (relatively speaking). I sort of wonder if last year’s drought set them back somehow. Like so many plants, last year probably affects this year. I’m pretty useless at intensive, focused weeding. I’m always going ‘Squirrel! !’ or running away from the bugs. But I am pretty good at wandering about ten minutes here, ten minutes there, here a weed, there a weed. We have a couple of particularly aggressive, rhizome/root mat spreading weeds. Bishop’s Weed anyone? It is well and truly entangled in the garden, which has a number of either delicately rooted perennials or perennials that do the self seed/root spreading thing as well. In other words, hard to weed. So, what does one do? Well, the easiest thing is to basically give up on it. The other option is to re-dig the whole thing and remove all suspect roots. I’ve tried that in a vegetable garden, wherein one can remove Everything, even there it doesn’t quite work. So I’m experimenting with another approach, which I trialed last year on a very small area. And which worked to gain control, though not eradication, of Garlic Mustard on a very large scale. Step One: stop believing that the weed is some super power. It grows and dies just like any other plant. Step Two: perfect is the enemy of the good: the day isn’t great for weeding, you don’t have that much time or energy, you don’t finish the whole thing…ok, but you did something. Step Three: If you see a leaf of the enemy you pull it or break it off. You don’t try to eradicate the whole plant (root mats here) You simply make it very, very hard for that plant to compete. No leaves, no plant. Yes, it will pop back up again, but guess what? I’ll be walking past again. If the deer can eradicate choice perennials that way, by coming past nightly and eating as they walk, I figure it ought to work. We will see. 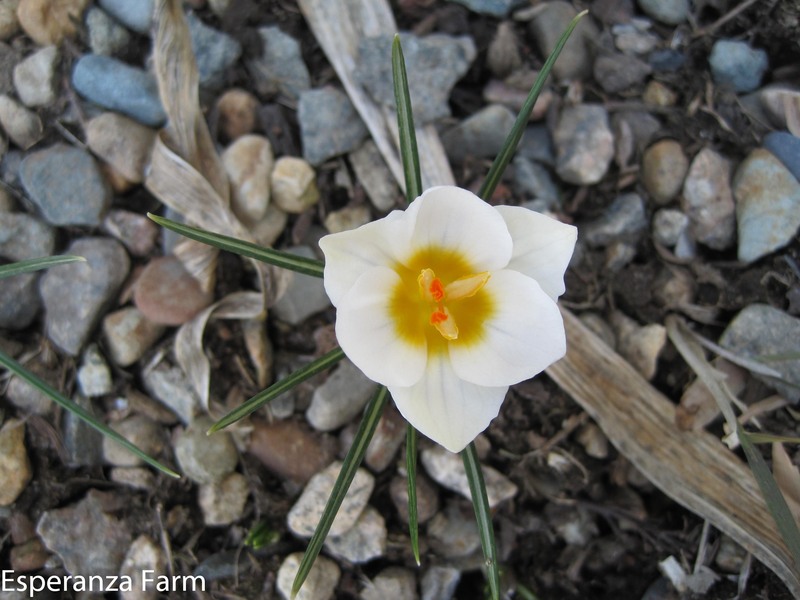 I am forever moving plants….usually shrubs. Eventually they get into the right spot and they like it. But quite often it takes some shifting about to get it right, usually only once but that is quite common. The current record holder is a blueberry bush. It is on its third or fourth relocation, always in places where other blueberries are happy. I think the real problem with it is that it is a Fancy Blueberry bush. In fact, it is a rather dubious one that I picked up because it had gorgeous fall color (which it does), good form (till it died back) and was 75% off. It also has pink blueberries supposedly. Not that I have ever seen them. But its overall unhappiness reinforces my impression that sometimes we can fiddle a plant a little Too Far. Often the variegated or odd colored fruit types have less vigor than the ones that are closer to the original type. Further reinforced by playing similar musical plants with a variegated dogwood as well. It seems to need a little bit more moisture, and besides I’d changed my mind on a tall thing (not that it had grown mind you) in that location. Round and round we go! *Unless you turn it into a greenhouse, then you can get a zone or two without any added heating elements. But it is tricky, plants don’t like enclosed spaces. What is it with the rodents this year? 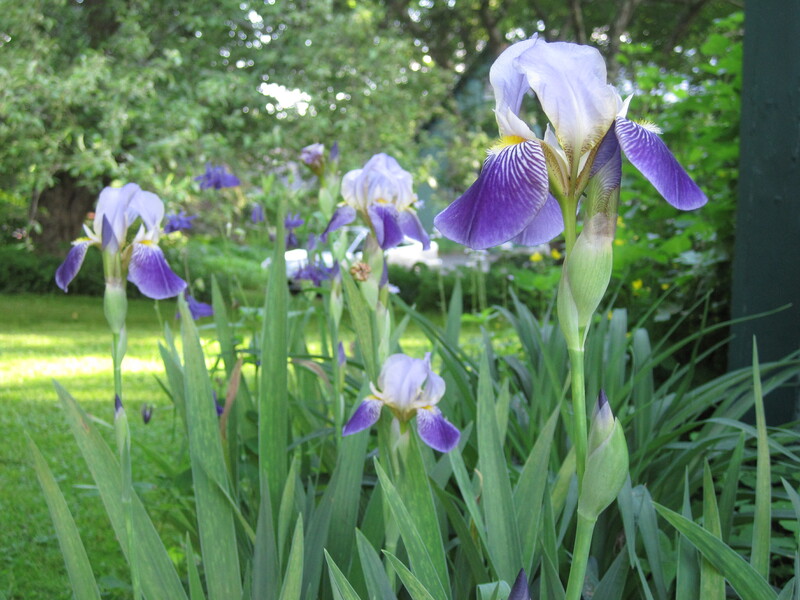 I suppose, at some level, I ought to be glad….they’ve thinned the Siberian Iris for me, very effectively. Not so good though….they’ve also thinned every single other garden bed as far as I can tell. Or at least ones that we can usually let run without interference all summer. A good acorn crop, a lack of predators, and no rain I suppose? High population that stays high and looks for good, ie fleshy roots/tubers/bulbs, food in soft ground? Anyone have some extra snakes? all lawn furniture stored for the winter: I can’t claim any credit for this one….of course, I also can say I never sat down but once in any piece of it this year….agh! the chard and the beets have survived the frost and snow so far. I still need to deal with the carrots, but like the parsley they aren’t bothered by the cold. I really need to clean up the squash and tomatoes though, maybe next weekend. It doesn’t seem like it is quite time to chop down the hostas or lilies yet, again I think by next weekend they will have truly died off. I like to let them get as much nutrients back into the root system as possible. The ‘Christmas’ cactus refuse to bloom correctly. I think they are going to beat Thanksgiving this year. Meanwhile the amaryllis will no doubt not bloom till May….faux silk flowers anyone? I’m keeping the row of chard going, I hope, with some good row covers. But I’ve decided that the chard leaf is really not the most interesting bit at all. So far, I have successfully used chard stems: solo; in an Italian sausage/olive pasta sauce; roasted with carrots/shiitake mushrooms/potatoes; with chicken and tomatoes; in a pork stew; and with mixed greens. Think celery but sweeter/nuttier in flavor and with a less determined crunch but plenty of structure. An excellent vegetable. The stem that is. The leaf… Well, I like it, far, far more than kale (which takes virtue a bit far, never mind the bugs) but for leaves, spinach is best. Chard and beets (a cousin) compete but can’t quite win out. Unfortunately, frost kills it. We will see what tonight brings. Winter has to come some time! I spent an entertaining hour this morning contemplating the economics of growing Shiitake mushrooms. (the tennis court would be Ideal) A friend of a friend thinks we ought to plant Paw Paw trees. * A very good friend wants to transplant some of the struggling Ostrich Ferns (the area next to the drive is simply too dry on average these years) down by the pond. They make the best fiddleheads it would seem. Though, then I might not get that trip to the deepest backwoods of Maine in the spring…not that we ever have time. I wonder if Goldenseal or American Ginseng could grow here? Is there perhaps a new direction somewhere in all these ideas? A century ago it was dairy cows, today New England farming relies on the local, the slightly odd, the high value as a supplement to other income streams. It is an interesting avenue to contemplate. And one h–l of a cliff. But then, there is a winery next door and a flower farm across the street…. *I remain unconvinced about a fruit that possums love and that tastes like banana custard…. It being Labor Day weekend, I have begun the fall clean up process: moving the Amaryllis collection to an indoor location, brush cutting the tennis court area, cutting back certain plants such as the thistles (whose seed heads are neatly propped up in the juniper for the birds but no longer flopping on the lawn. And otherwise beginning that sort of tidying. By the end of October all of the house lot will have been brush cut, neatly going around young trees and shrubs that look like promising seedlings in reasonable locations. I have begun cutting now because, as much as I like it, the white wood aster is getting completely out of hand. I want it in certain spots, not blanketing the entire place. 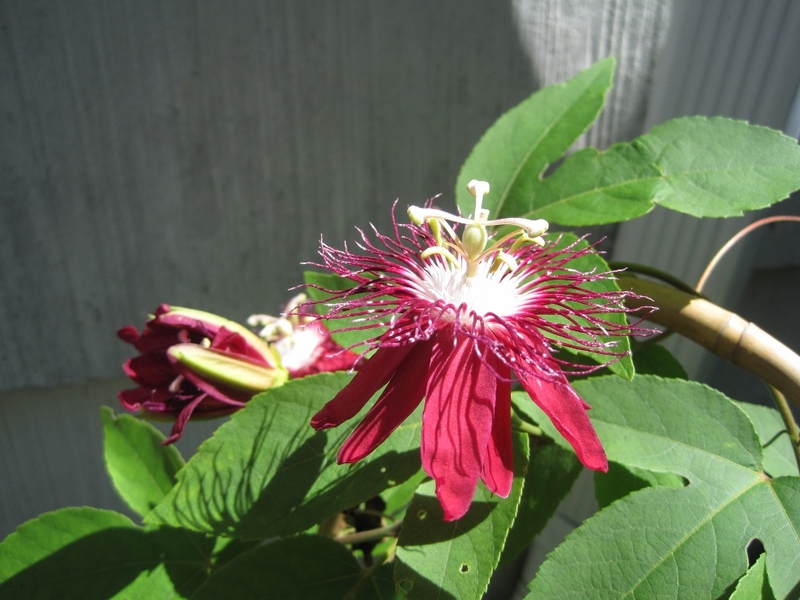 By cutting it just as it begins to flower, I will set it back hard, while not cutting the things that I want to keep. Many of the things I want to keep need to run at least through August before being cut (some of the grasses and mints for example), furthermore many of the insects need to have the tall grass at least that late. Or that is the theory! Complicated. It does however ignore the current conditions: hot and dry with no rain in the forecast for another month. Aside from one thunderstorm in early August, we have had no measurable rain since June, following a winter of no snow. It is survival of the fittest out there.